"Cardiff should feel privileged to host such an event." "Cardiff often gets left off the list of cities to tour, particularly for musicians at the more experimental end of the spectrum. But green shoots spring forth in the form of From Now On, bringing more esoteric approaches to rock, psych and composition to South Wales"
Mark curates and produces From Now On with Emma Daman Thomas. 2017 - The Future Is Female - Lone Taxidermist, Charismatic Megafauna, Kayla Painter, Accü, Adwaith, Shrouk El Attar’s Dancing Queer, Bishi Bhattacharya, Jenn Kirby, Miriam Khartoum aka Miri Kat. 2014 - Richard Dawson, Euros Childs, Lucky Dragons, Gwenno, Rhodri Davies, Thought Forms, Bridget Hayden, R. Seiliog, Trust Fund, Hail! The Planes, The Jelas, Serafina Steer, Laura J Martin, Trwbador, Dan Hayood, Tender Prey, Aidan Richard Taylor, Canolfan Hamdden. 2013 - From Now On launch at Experimentica. Jerusalem In My Heart. Mark has been supported as a Creative Producer to make From Now On happen by PRS For Music Foundation (2013-2017) and Arts Council Wales (2015 + 2016). 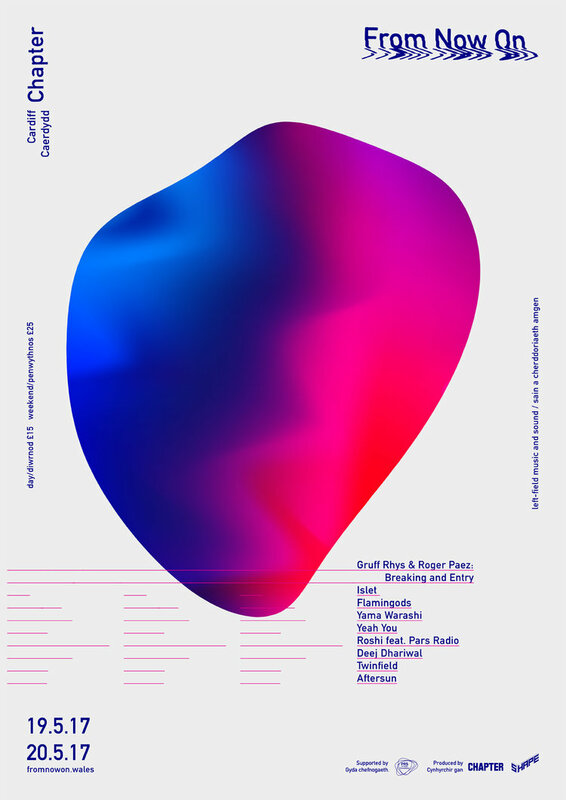 Shape Functions Gigs / parties / happenings in Wales. I have also curated stages at Green Man, Focus Wales and Swn. Artists include: Thee Oh Sees, Hookworms, Islet, Seabear, Cate Le Bon, Jane Weaver, Mount Eerie, Ganglians, Yacht, Gwenno, Flamingods, Yuck, Wavves, Joanna Gruesome, Sweet Baboo, Blood Sport, Munch Munch, The Jelas, Crystal Antlers, Hiss Golden Messenger, Half-Handed Cloud, Lake, Truckers of Husk, Mowbird, Crystal Antlers, Evils, Barringtone. Black Is The Colour A one-off All Hallow's eve event in 2015 commissioned by the Wales Millennium Centre. Artists: Sarah Angliss, Bill Orcutt, Ratatosk, Spectres and Artefact. H. Hawkline Residency A weekly residency for H. Hawkline in Clwb Ifor Bach every Thursday in February 2015 to coincide with the release of his album 'In The Pink Of Condition'. Artists included: Sweet Baboo, Gwenno, Tender Prey, Alex Dingley, No Thee No Ess, Gruff Rhys (DJ), Heavenly Jukebox. Chapter New Year's Eve 2015 Commission from Chapter to curate New Year's Eve. Artists: Bass Clef, R. Seiliog, Gwenno, Macho City, CAM DJs, Ewan Jones Morris’ NYE Countdown Visuals. Zinesters A one-off event in partnership with Diffusion International Festival of Photography & Chapter. It involved performances from bands and artists who have self-published zines as part of their practice to compliment Diffusion's publishing weekend.